Lovely mama to be, and looks like a beautiful shower. What a fun time for you all. Your flowers are stunning Nora! Blessings to all! Love the new dress, and Nora’s scarf is fabulous. Oh what wonderful photos and I love the video. Kat is just beautiful and what a wonderful surprise from Saks. I have a thing about babies lol. The descriptions are so awesome it feels like I was there. I am sorry that you are having to deal with a bad tooth. I understand the pain and aggravation for sure as I have dealt with it but finally I have gotten my dentures and I am very pleased. Have a wonderful Memorial Day weekend and I really hope that you enjoy sitting beside your water feature with a bellini, haha yeah that I could totally go for spending time just relaxing with the sounds of nature. Have a good one bye and take care. Sounds like the perfect outing and homecoming. Time in the gardens best therapy of all. Thanks for sharing! Thank you for sharing the wonderful surprise baby shower. Mama-to-be, Kat, looks glowing. Nana must be in seventh heaven buying those baby clothes, I love baby clothes – they are so cute and so tiny, and these days the selection is huge! Your iris and peony are lovely – my dad has red peonies and they are blooming like crazy. The water fall is truly zen – thank you, Laura, for the mini video – the sound of running water is so soothing and calming. Good luck on the tooth extraction. I have a small mouth and in herited my parents’ large teeth. I had over 18 teeth removed over the course of my childhood, both baby and adult, so tooth extraction became a norm for me. Can relate to the teeth, I had to have one pulled a couple months ago, not fun, but much better than the 4 wisdom teeth at once over 45 years ago. I am not a happy dentist goer at all. Love the pictures including the lovely water feature, I do think it would be the place to have a bellini. What a lovely trip, especially with the surprise shower. I love that water feature. I think I’d spend way too much time there is it were in my backyard. It’s a good thing I live near the ocean. What a lovely surprise for mama to be! Love the water feature. I have planned something very similar. Good luck on the tooth Nora. Nora, you are an amazing mom in law! Kat looks beautiful & very well! I have little grandsons & they are such fun to be with. Clothing for boys is as good as clothing for girls now! I love your beautiful garden and water feature! Congratulations to Kat and the family! Thanks for sharing…sounds like a lot of special moments in one update. Good luck at the dentist..hope it goes well. Thank you, Kat and Nora, for sharing your lovely baby time. What a day you had! The iris remind me of the half lot of iris my mom had, with poppies mixed in. A riot of color each spring. Good memories. What a wonderful event! Hope all are safe at home, hear there was massive flooding in some parts of Maryland today! Thank you!! Always enjoy the updates!! Best to Kat and approached no arrival!!!!! What a lovely baby shower! Really special memories for all. Best wishes to Kat with the rest of her pregnancy. I love the garden photos and the water feature is just wonderful. I just got Shelter in Place and I can’t put it down. Your books just keep getting better and better! Thanks for sharing so much with us and writing such terrific books! Congratulations Kat and Happy Birthday! What a nice baby shower surprise. Looks like a great trip with wonderful friends. Hope you are feeling good and enjoyed your trip. Hope you see you at the next signing. Take care. The water feature is splendid! Now that’s what I call a baby shower, Yay! Wishing Kat an early birthday,a quick delivery, and a very healthy baby, so happy to see such a wonderful celebration! And, oh the video of the water feature is a definite keeper! Is everyone okay there with all the flooding going on? Nora, Kat, Laura at Al, you all looked so nice. HaPpY early Birthday Kat! Supposed to have been et al not at Al. 😏 Darn autocorrect! Flooding is well southeast of us. Poor Ellicot City! Glad to know the flooding is not in the Boonsboro area – the video of the rampaging floods down a street in Ellicot City was frightening. Was afraid of a similar fate to downtown Boonesboro and Inn Boonesboro, which I haven’t had the chance to visit yet – hopefully soon. Wishing the area safety from the flooding. Wonderful baby shower surprise. It is so fun to be a Grandma & get lovely clothes for the baby. I just had an extraction last week. It was painless but the week after was no fun. Stock up on soft foods like yogurt & cottage cheese. Good luck. What a fun time! My son has a water feature in his yard and a swing by it. So peaceful!! And Nora’ s flowers are gorgeous. Wow, Nora you run me ragged 😉 so much bits and pieces of amazing times and memories. Kat looks lovely and I hope her hand was nothing serious. She glows and in my culture they say a boy does that to his Mom ❤️ (love abounds already). Not along the subject area (altho’ loved the baby shower pics the flowers/garden pics are wonderful!!! 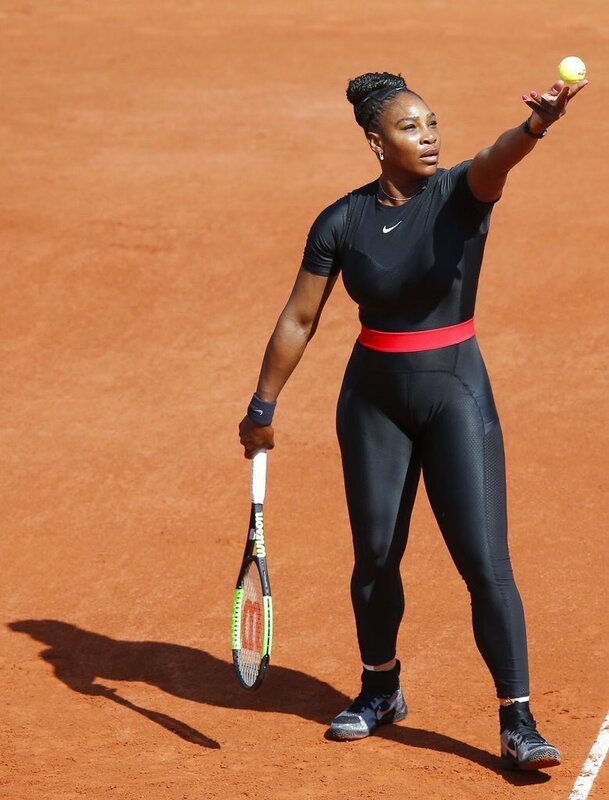 ), but saw this picture of Serena Williams in her catsuit playing tennis & had to wonder, is this what J D Robb refers to as a “skinsuit”? Serena looks amazing! all that, & I forgot the image link! Yeesh! And Nora, Denistry has come a long way in 40yrs. I had a root canal on one of my back molars 2yrs ago, and it was fairly painless. Congratulations (and Happy Birthday) to Kat! What an exciting time for you all. I love the garden photos; such a beautiful place for relaxing and enjoying nature. The one shot of the iris is stunning. P.s. Hope all went well with the tooth extraction! I Love your garden (happy birthday Kat) Congratulations to the family.